How lucky am I to have a bunny AND baby chicks on Easter! My girls were chirping and happy this morning. They seemed more active and interested in their surroundings. It became apparent that the office was not the best place to keep my little brood. Sammy and Rowdy my 7 month old kittens showed a morbid interest in their new family members and kept trying to paw their way under the door. Jim had the great idea of putting the babies in Buster’s old bunny cage. 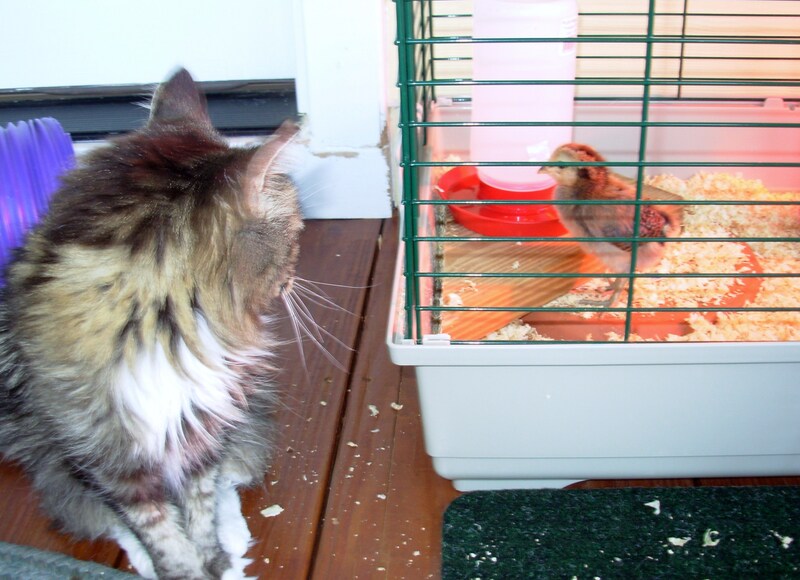 It’s a secure environment where the kittens can watch the chicks but not get to them. We set up the bunny/chick cage on the back porch where Buster, Missy & Boots (our two old lady cats) and Rowdy and Sam could all have their own little HDTV version of Animal Planet. The kittens were recently declawed but not before they both developed a taste for birdflesh in our back yard. Rowdy thinks that Daisy is full of yummy cream filling.